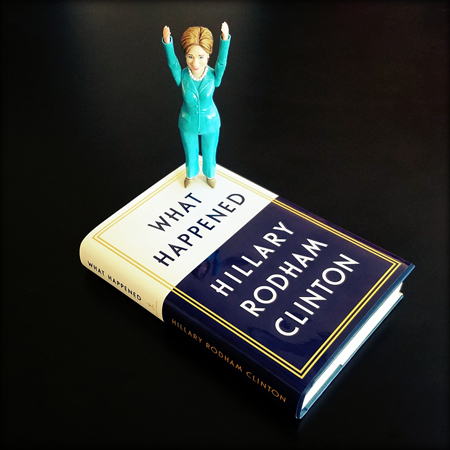 This is the sixteenth and final installment of the What Happened Book Club. So let us conclude our discussion with Chapter Seventeen: Love and Kindness and Chapter Eighteen: Onward Together. These, too, were difficult chapters to read, for a different reason. Hillary Clinton ends her book on a note of optimism, sharing with us her belief that we will be okay. It is an optimism I don't share at the moment, though I hope to be proven wrong. Her final words, however, are "Keep going," and that is a sentiment with which I agree, and advice I eagerly take. There was still a lot I loved about these final chapters; the section about Eleanor Roosevelt was a particular favorite. I liked seeing the criticism she got as First Lady for being "new agey" through her eyes, and it was both enlightening and sad to learn how she struggled to find a way to convey a simple message about community, empathy, and compassion without inviting vicious political blowback. And to end my piece about these two chapters, I am going to go back to their beginning. Politics has always been a rough business. Thomas Jefferson and John Adams hurled insults at each other that would make today's nastiest politicians blush. It's just how the game is played: Every campaign seeks to draw contrasts with opponents and media want to cover conflict. So it's not surprising that two words you don't hear very often in our knock-down, drag-out political brawls are love and kindness. But you heard them from our campaign. It started as something I'd occasionally mention at the end of speeches, how our country needed compassion and a spirit of community in a time of division. It eventually became a rallying cry: "Love trumps hate!" Partly this was because the race felt ugly and mean and we wanted to be an antidote to that. But partly it was because I've been thinking for a long time about how our country needs to become kinder and all of us need to become more connected to one another. That's not just a sweet thought. It's serious to me. If I had won the election, this would have been a quiet but important project of my presidency. Instead, Donald Trump won the election, and the theft of love and absence of kindness has been a loud and brutal project of his presidency. That we are not being governed by a president who wanted to make love and kindness a centerpiece of her presidency may ultimately be the greatest loss to this nation. It is a thing unseen; most of us will never grieve the loss of what was never there. But those of us who know what could have been understand, with certainty and pointed regret, in how very different a place the republic would find itself, under the circumstances that were possible but denied. People sniff carelessly that, had Clinton been elected, the country would have been just as divided. Republicans would have moved to impeach her and Trump voters would viciously hate her and the nation would be tearing apart at its seams. Maybe so. But the president being a target of invective is a very different sort of divisiveness than the president hurling the invective. But of course there is no more compelling argument for love and kindness than this: Its paucity is what opened the door that Donald Trump walked through. On November 10, 2016, I wrote that love would be the center of my resistance. So it has been, and so shall it continue to be. No matter how much I loathe Trump (oh so very, very much), I will always love the people for whom I resist even more. Thank you for your love and kindness, Hillary Clinton. And thank you for this book.